The Golden Horseshoe was first run on Exmoor in 1965, but the current organiser Barbara Wigley, 67, retires this year, and no one has yet stepped up to take the helm. On the eve of its 50th anniversary, which could be its last, we take a look back at the ride’s history. 1. The first ride was organised in 1965 by the British Horse Society, promoted by author Ronald Duncan and Colonel Mike Ansell, and sponsored by The Sunday Telegraph. It was so popular that organisers had to close entries a month early, having reached the limit of 110 entrants. 2. The route started at Malmsmead and finished at Ronald Duncan’s home in Welcombe, Devon. The FEI today voted unanimously to modify the organisation’s Statutes to allow the FEI President to receive remuneration. The amendment to the Statutes opens up the possibility for remuneration, but the final decision still rests with the FEI Bureau, which will discuss the issue at its in-person meeting in June. The vote was taken at an Extraordinary General Assembly (EGA) held during the FEI Sports Forum at IMD in Lausanne (SUI). A total of 59 National Federations were on-site to register their votes and there were 27 powers of attorney, giving a total of 86 valid votes. The required quorum is 67, half of the 133 National Federations plus one. FEI President Ingmar De Vos, who opened the second day of the Sports Forum, excused himself from the EGA and handed over to FEI 1st Vice President John Madden (USA) to chair the meeting. FEI 2nd Vice President Sheikh Khalid Bin Abdulla Al Khalifa (BRN) and FEI Secretary General Sabrina Zeender also presided. Dr Claude Nordmann of the Swiss National Federation spoke briefly after the vote, calling for a study to be conducted on salaried positions and commenting that the contents of the study would also be useful for other International Federations. The EGA also voted unanimously to a number of proposed changes to the Internal Regulations of the FEI, including the addition of the President to the list of signatories to official documents. Over the past couple of years, I have hammered on pretty annoyingly (to some) about the highly dubious objectivity of the FEI’s repeated use of Lord John Stevens and his company Quest in its investigations into various and sundry scandalous situations which have primarily involved Endurance. Well guess what. Turns out I had a point. Prior to lodging its appeal, the UAE National Federation had sent a formal request asking the FEI Bureau to lift the suspension. The request was rejected by the FEI Bureau and, as a result, an official appeal has been lodged by the UAE National Federation. “It is disappointing that an appeal has been lodged and that the UAE National Federation has chosen to go down the legal route rather than seeking ways to solve the issues and make a lasting commitment to improving the welfare of the horse at Endurance events in which it is involved”, FEI Secretary General Sabrina Zeender said. “The FEI is revolutionizing equestrian sports on a global basis, bringing every discipline to the highest level of competition,” said Beth Cross, founder and CEO of Ariat International. “Ariat is proud to partner with the FEI as the official equestrian footwear and apparel supplier. We offer the most innovative performance footwear and apparel for the world’s top equestrian athletes, making our partnership with the FEI a terrific match. Our goal is to work together to continue to grow the sport globally." In seven days’ time, the FEI and stakeholders gather in Lausanne, Switzerland to debate the most significant shake-up ever of its elite sport. ...By far the most numerous authentic posts at the time of writing are, ahem, all about endurance. The key change there is a proposal, from the FEI endurance committee, that the WEG championship ride becomes a two-day, 100km-per-day contest. The ambition is to re-establish the notion of partnership, so that the rider reads his horse and keeps enough fuel in the tank. It is clearly intended as an antidote to the lets-go-really-fast-on-a-horse-we-don’t-know-and-somehow-waggon-it-over-the-finish travesty allowed to develop in the UAE and sadly now spread elsewhere. On that subject, it’s still business as usual in the UAE. Clearly the penny still hasn’t dropped about what has to be done before the Emiratis can return from FEI exile. In conjunction with the 2015 Danish Endurance Championship, Peter Christiansen of the Association Molsridtet is organizing the 1st World Endurance Summit on in Mols, Denmark, beginning July 28th. The summit is being held because the group loves the sport of endurance, and they want to "contribute to the ongoing development of endurance as a sustainable sport" which has the maximum focus on horse welfare with the absence of doping. During the summit, discussions will focus on the state of endurance today and the direction participants would like it to develop in the future. Lectures and workshops will be held concerning ethics in endurance, and veterinarians will speak about research projects related to endurance riding and the use of horses in endurance. On the last 3 days of the summit, several events will take place. On Friday, a "Mini Tri Endurance" will take place, with a 40 km endurance ride, 20 km of cycling, and 5 km of running. On Saturday August 1, CEI3*, CEI2* and CEI1* endurance rides will be held. The 2015 CEI2* Danish Championship will take place Sunday, in addition to a CEI1*, and an 80 km, 60 km and 40 km national rides. The summit is open to all nations, and all international and national riders. A young Queensland grazier is about to embark on the longest and toughest endurance horse race in the world all in the name of charity. Bogantungan grazier William Graham says he is preparing for the adventure of a lifetime in the form of the Mongol Derby in August; a race that will see him travel 1,000 kilometres in 10 days through the Mongolian Steppe on horseback. 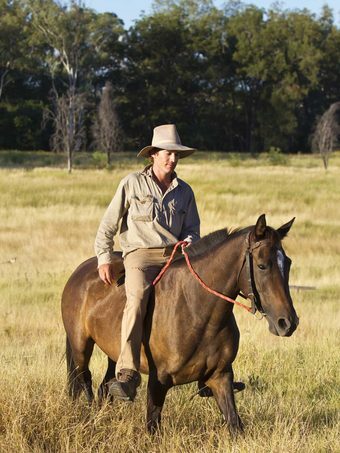 The experienced rider uses horses on his property, west of Emerald in central Queensland, on a daily basis but says nothing will fully prepare him for the challenges of navigating the terrain in Mongolia. "I'd say I've got a bit of an advantage, I know how to navigate around the bush and can ride for hours," he said. The track competitors follow is based on the postal route established by Genghis Khan, which saw the mail delivered via a number of horse stations across the country up until the 1940s. Apart from the distance, riders will also have to battle the rough terrain, semi-wild Mongol horses and an unfamiliar diet of Mongolian local cuisine. Many riders don't complete the race due to injury or illness. But William says that's all part of the adventure. "It might be painful for a while I suppose but the experience and the sense of adventure and the desire to win [will keep me going]," he said. He says he expects the race to be mentally and physically challenging. "You're only allowed to ride between the hours of 8.30am and 7.30pm, which is a fair stretch," he said. "Then you camp with the local tribe wherever you get to and you eat their tucker, so I'm looking forward to a bit of mutton. "Apparently you have to have a few drinks with them at night time, I don't know what we'll talk about but I suppose we'll find something," he added with a laugh. 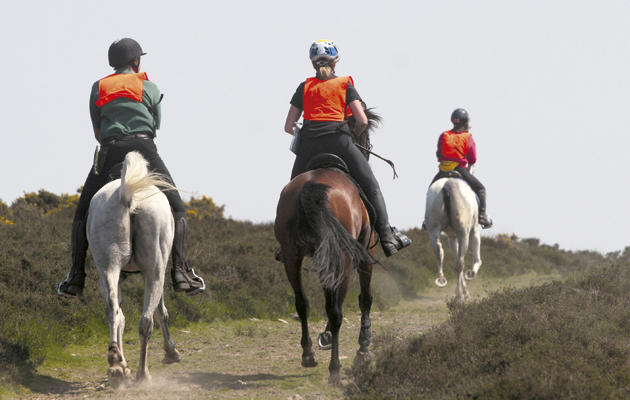 The race is run by a United Kingdom-based adventure company, which ensures each horse is only ridden for about 40 kilometres a day before the riders are instructed to swap for another at each station. Participants have to pay a large sum to take part in the race to cover the cost of the animals, food and support personnel but William is using the adventure to also raise money for the Royal Flying Doctor's Service through donations. "They've given me a couple of rides over the years and they need a lot of money to keep that outfit running," he said. "We're not even isolated but for a lot of people the RFDS is a vital service for the bush." The Mongol Derby will run from August 2 to 16. If you would like to donate to the RFDS through William's ride, please email the ABC. Future World Equestrian Games endurance champions could be decided in a two-day format, with competitors covering 100km each day. The Endurance Technical Committee is putting the proposal to the endurance session at the FEI Sports Forum, being held in Lausanne, Switzerland, later this month. The proposal involves ditching the single 160km race which has been used to decide the champion in favour of the two-day format. The format would set the maximum number of combinations from each national federation at four, with the highest three counting for the team classification. “The purpose of the format change … is to create a technical competition to test the skill and the fitness of the combination over a course that needs a strategic approach rather than reliance on speed alone to successfully complete,” the committee said. The mounted best-conditioned competition would assess the combination for fitness, soundness and agility of the combination in the same manner as they competed the event. 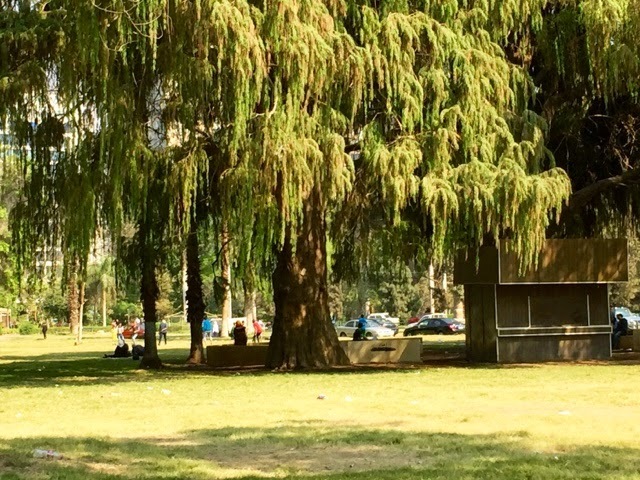 A football game goes on beyond a lovely tree in Orman Gardens in Cairo during the annual plant and garden show. A website, world manifesto, and petition have been organized in support of the Emirates Equestrian Federation of the United Arab Emirates regarding their suspension from the FEI world governing body of horse sport on 12 March 2015. The group of riders, trainers, grooms, breeders, horse owners, veterinary surgeons, farriers, organising committees, public agencies, private bodies and associations, assert that compliance with rules, fair play and safeguard of horse's welfare are the main principles on which their experience in endurance is based. The manifesto states that the suspension of the UAE "leave an indelible mark on the history of endurance" and risk development on an international scale. The EEF has for many years, the mission statement claims, "helped promote the development and success of endurance throughout the world, bringing it to the fore through increased membership and contributing to its popularity in an ever increasing number of countries." The EEF has brought advantages to the sport of endurance racing, including "the development of horse’s performances and for the quality, genealogy and number of foals born per year in terms of the breeding," and economic opportunities "which absolutely cannot be ignored." Already the suspension has "triggered a spiral that is affecting directly and irreparably tens of thousands of people, who very soon run the risk of finding themselves without employment." With already over 400 signatures, this Manifesto will be presented to the FEI, urging them to review its position on the UAE suspension and consider the damage in "the development and expansion of endurance and its economic and financial consequences." It further urges the FEI to look for a joint solution "with Emirates Equestrian Federation and all those involved in the sport in order to enforce the rules, the fair play and to safeguard the horse’s welfare." More than 400 horses and their riders set to tackle 160km in 24 hours will gather at Wisemans Ferry in June, marking 50 years since the inaugural Tom Quilty Gold Cup. Known as ‘The Quilty’, the endurance ride which attracts competitors from across the country and internationally, will be back on local soil after organisers campaigned for its return this year. It was supposed to be held in Victoria. It’s considered a premier ride on the Australian endurance calendar and the national championships for the NSW Endurance Riders Association (NSWERA). Del Rio Resort will be the camp base (start and finish) for the ride which will wind through national park trails, rural roads and private properties. Horse and rider are required to complete the set course in 24 hours from June 6-7. The ride starts at midnight. It seems that the world’s major powers have struck a deal with Iran over the future of its nuclear programme after lengthy talks in Lausanne. There are still the details to be thrashed out, of course, but the negotiators seem cautiously optimistic. One suspects these aren’t the toughest talks that will unfold in the Swiss city this year. Up the road, staff in the Lausanne headquarters of the FEI face the joyous prospect of trying to strike some kind of accord with the United Arab Emirates Equestrian Federation over endurance. It doesn’t look easy to me. The UAE federation had its FEI membership suspended last month over what the world governing body described as welfare concerns. Members of the Crabbet Organisation came together recently to celebrate its first endurance awards for Crabbet or Crabbet-related Arabians who have competed with Endurance GB, SERC or the FEI during 2014. The Compass Inn’s Orangery, near Badminton, Gloucestershire, was the chosen venue for the event, which also featured awards for young stock graded by the BEF at Futurity events. A total of 40 members, including many from the South West, travelled from across the country to attend the event, which was generously supported by The Pure Feed Company, Ariat Europe, Brinicombe Equine, Verm-x, Blue Chip Feed, Horse Scout and West Kington Stud. April 2015, Poland ~ Leading Arabian horse breeding authority and world ambassador of the Arabian horse, Izabella Pawelec-Zawadzka, passed away after a long illness on 28 March 2015. 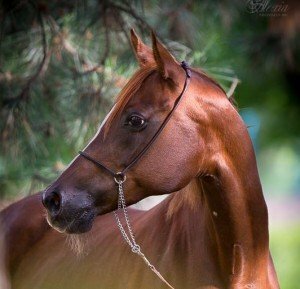 Known as the First Lady of Polish Arabian horse breeding, she had a great influence on every aspect of the breed. A gentle, caring person, she had a great following in the community of the Arabian horse. 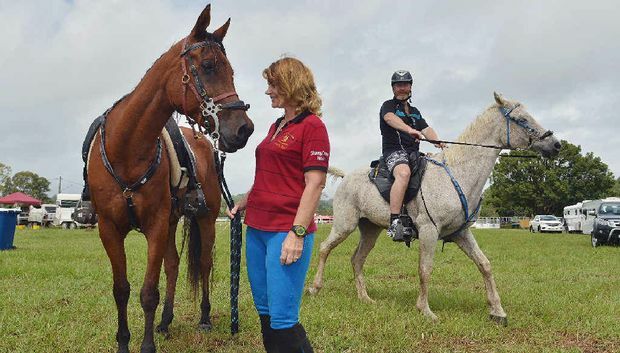 DESPITE wet weather threatening a wash out, the Far-A-Way Easter Endurance Carnival went ahead, ending with the marathon yesterday at Imbil Showgrounds. After heavy rain on Thursday evening, Friday's 80km, 40km and Mini Marathon were cancelled. Organiser Ken Moir said they were looking at a washout but the sun came out on Saturday to bring home remaining competitors. A HORSE rider from Walsall is jumping for joy after winning a top accolade with her one-eyed stallion who was originally destined for the slaughterhouse. Julie Griffiths won the Sport Endurance National Championship on Cannon, a 16-year-old standardbred trotter. The championship – which tests the fitness of horses and their riders – was awarded after the horse rider bettered around 60 other competitors. Julie and Cannon both went through a series of competitive and pleasure rides over a period of 12 months, which were scored on points. "It's been a long road but we've finally done it," said Julie, aged 47.